HH: Though many people who create folk art are talented, skilled artists, folk art is at the same time something that lay people can confidently engage with and participate in. Some very charming folk art is not perfect, but contains irregularities that reveal the hand of the artist. This is certainly the case with my work. I am not skilled at drawing, but I don’t think that fact precludes me from making interesting folk art. One of the things I find appealing about making contemporary folk art is that you can draw from a broad set of existing designs to use in your own work. Making folk art does not demand that you be completely innovative. Instead, anyone can borrow and recombine existing traditional designs to create new folk art, without worrying about being completely original or about copyright laws. Folk art is a collective project. As a result, using folk art in my visual poetry has fit in nicely with my interest in found poetry. In these poems I wrote the letters in by hand in order to suggest the feelings one might have about a language, specifically a parent’s first language. Because I do not speak Hungarian as well as I speak English, and because I learned it in a very particular context, I have feelings about the language that I don’t have about English. Reproducing this visual poetry in print will accomplish something akin to publishing a confessional poem. Though I am not physically creating the piece when it is reproduced, it will carry evidence of my hand, such as the way I draw a letter, or the imperfect lines of my drawings. I can’t speak Hungarian perfectly, I can’t draw perfectly, I can’t draw letters so that they looks like professionally designed type—working on this folk art visual poetry allowed me to express and validate my linguistic, emotional experience. GB: How do you imagine that the work engages with notions of Hungarian culture—and the extended Roman alphabet used in Hungarian? What is normative language? How do you see the multiplicity of language identity and the visual representation of sounds that aren’t in English? HH: Though I spoke Hungarian every day until my mid-twenties, I only learned how to read it properly over the past few years. For me, written Hungarian was mute, and so it was intuitive for me to use it in visual poetry. Hungarian was inherently concrete and stripped of linguistic meaning. Before I knew anything about contemporary visual poetry, I would sketch folk art tulips in my undergrad class notes, with a letter replacing the centre of the flower, accents replacing the stamen. For me, not being able to read Hungarian made the look of the written language seem like part of traditional Hungarian visual culture. As for the multiplicity of language identity, I always found that there was something very stubborn about written Hungarian. It’s a totally phonetic language, and it’s written using a script that I can read in both English and French. I completed Magyarazni in tandem with an oral history project, where I interviewed dozens of people who either came to Canada from Hungary in 1956 as refugees, or who are the descendants of such refugees. One interviewee who was born in Canada complained that often your parents or others of their generation insist that you speak Hungarian, that you be a Hungarian, but on the other hand you’re made to feel like you’ll never be a real Hungarian. I empathize with this anxiety, and it explains in part my feelings about written Hungarian. I felt like I should be able to read the language, but I didn’t find the prospect of learning to read Hungarian a welcoming endeavour. Using the Hungarian alphabet in visual poetry was a way for me to express my relationship with the written language—that I find it concrete and stubborn, and that for me the meaning is not linguistic but carried in the look and form of the writing. GB: What about tradition? And otherness that isn’t otherness, but the locus from which identity is constructed or inherited? 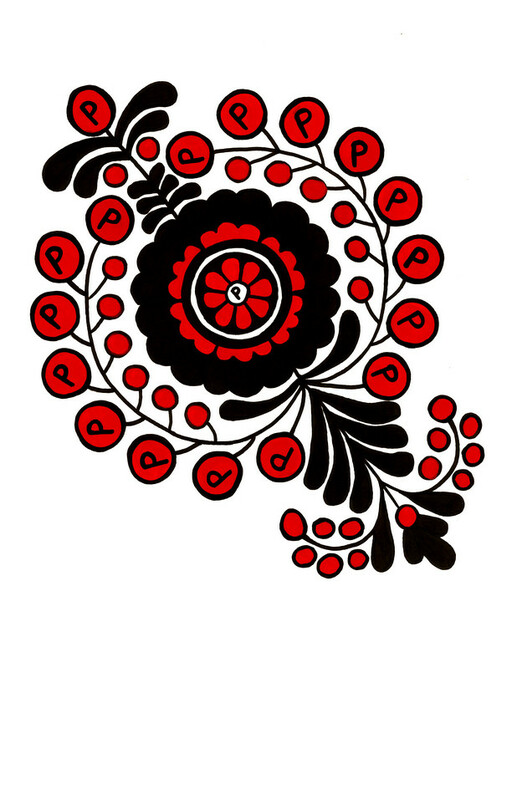 HH: Another interviewee for the oral history project observed that while most of the Hungarians she knows who live in Canada have loads of folk art in their homes, people she knows who live in Hungary do not. I think that being separated from their home culture, especially under traumatic circumstances, makes these reminders of culture appealing and comforting for many people. Growing up around a lot of folk art, I certainly grew to associate it with Hungarian identity, with my father, with the cultural community we were a part of. Folk art can be a trigger, the way a certain food or song can carry a lot of associative cultural and personal meaning for an individual. GB: How are these texts decorative designs vs. poems which explore how language and culture are represented from a repertoire of signs and/or in conventionalized symbols (flowers, letters)? How do we privilege certain types of image vs others? HH: These are poems and not decoration because they engage with ideas of language and culture, rather than beautifying an item for the sole purpose of making it pleasing to look at. Both the letters and the flowers suggest something bigger. The letters suggest a full, living, breathing language, and the flowers suggest both a broader historical folk culture as well as botanical life. This work privileges letters as emblematic of language rather than, say, recordings of all the sounds used in spoken Hungarian. As mentioned above, I used letters to engage with the written form of a language that I could speak but not read, exploring the written language’s status in my mind as a set of mute symbols whose linguistic meaning I could not understand. I used only flower designs because though these designs might suggest lush, living foliage and blossoms, the flowers are highly stylized and flattened. This is analogous to the way I use the alphabet in these poems, that is, as a flattened version of a living language. The flowers are stuck—they won’t grow. In the complete project, each visual poem in Magyarazni is accompanied by a written poem, and one of the ideas that I explore in the written poetry is how language freezes when it’s transplanted to a new location and spoken by a small community. A number of the people I interviewed for the oral history project who were born in Canada mentioned that when they travel to Hungary people think that their Hungarian sounds odd, because the interviewees still use slang or sayings that their parents were using in 1956. Language normally grows and changes, but in a small, isolated group of speakers it can become inert, giving the language a historical, folksy feel. This phenomenon informed the creation of these visual poems, and the use of the stylized flower designs. HH: Certain mediums of folk art have traditionally been quite gendered. For example, women traditionally practiced embroidery, and men traditionally practiced carving. However, the floral designs were traditionally used in a variety of mediums. Flowers can be found carved into furniture, painted on pitchers, and embroidered on men’s and women’s clothing. My interest in Hungarian folk art was sparked by a wood chest that my dad carved, and that we used as a coffee table in the living room. On the other hand, in Hungarian scouts I was made to embroider things as a camp activity. All that being said, I feel like there’s something a bit academic about my work, in that it is on a page and not adorning a useful or decorative item. As a result, much of the context that would gender the designs is absent, and the book is something of a catalogue of designs. GB: In general, how do these images relate to class, to culture, to tradition, to Hungarianess and from there to the construction of a modern Canadian identity? HH: In terms of class, I’d say that because the project is drawing from folk art it is responding to the everyday, to a visual culture that is not necessarily ‘high-art’ but that is still intricate. These visual poems explore the intricacies of common language and culture, and the intricacies of my feelings towards the language and culture I share with my family and with other Hungarian-Canadians. As for the construction of a contemporary Canadian identity, for me my Hungarian identity is a peculiar component of my overall identity. It’s somewhat stuck—historically, linguistically, emotionally—and this quality of being stuck is what defines this facet of my identity. This project revels in my imperfect Hungarian, my low-level literacy in the language, presenting the imperfections as an interesting and intricate cultural, linguistic, and personal experience instead of presenting the imperfections as deficiencies. A piece of folk art is not ruined if a line is not perfect, just as my feelings of ambivalence towards my cultural identity are not imperfect but rather characteristics of my experiences. It was important for me to create visual poetry that captures this experience, because I think it is an experience that I share not only with Canadians of Hungarian descent, but also with others who feel ambivalent towards their cultural backgrounds. This ambivalence is a legitimate part of first-generation Canadian experience. I hope that these poems have a visceral effect on the reader, conveying the experience of a first-generation Canadian who might find their parent’s language beautiful, but at the same time historicized, distant, unreadable, and inaccessible. Helen Hajnoczky's first book Poets and Killers: A Life in Advertising was published in 2010 by Snare Books, an imprint of Invisible Publishing. She blogs http://ateacozyisasometimes.blogspot.ca/ and tweets @helenhajnoczky. Magyarazni was made possible by the Alberta Foundation for the Arts.